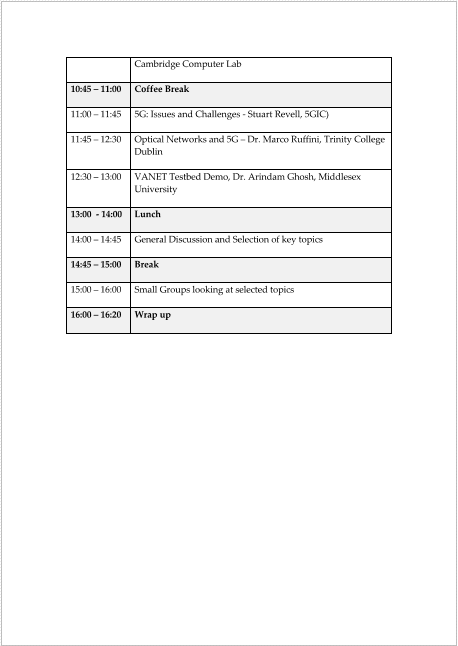 Future Networks Workshop @MDX !! Hear the “Success Story” from the CommNet2 Director himself! 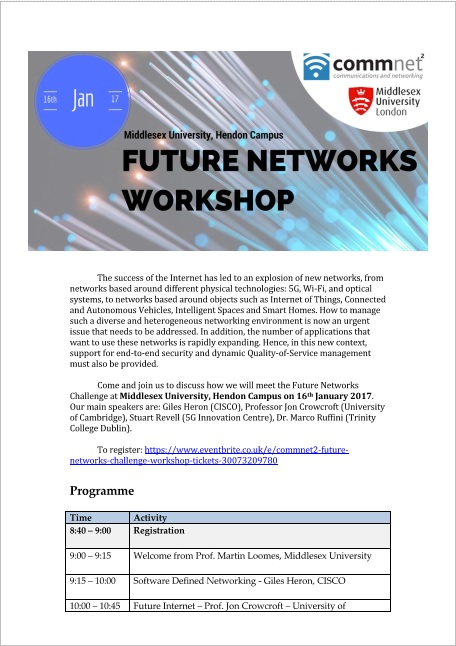 January 19, 2017 by Arindam Ghosh in Updates | Comments Off on Future Networks Workshop @MDX !! Hear the “Success Story” from the CommNet2 Director himself! Many thanks on behalf of CommNet for delivering a well-received workshop. I’m glad it ran smoothly, was strongly attended and generated a lot of interest for the community. Gemma has linked your activity and presentations to the CommNet website and we look forward to your report. Dr Arindam Ghosh received his BSc. (First Class Honours) degree in Computer Science from University of Kent (UKC) Canterbury, Kent, United Kingdom, in 2007 with distinction in his final year project. He was with Cisco Systems, in Reading, UK, (2007–2008), working as a year in industry placement as an intern. He received his M.Sc. degree in Computer Networks Management (with Distinction) from Middlesex University London, in 2009. In the year 2016, he received his Ph.D. degree in Vehicular Communication Networks at the Department of Computer Science, Middlesex University, London. Dr Ghosh is a distinguished member of several Professional Bodies in the UK, such as the Institution of Engineering and Technology (IET), the Bristish Computer Society (BCS) - (The Chartered Institute for IT). Dr Ghosh has also been awarded a Chartered Engineer (CEng) from the Engineering Council (the British regulatory body for engineers). He has also been the Principal Investigator (PI) for various UK Government funded projects which recieved grant funding from the Department for Transport (DfT) and Transport for London (TfL). His research interests include investigating prediction techniques for proactive handover approaches in Vehicular Ad hoc Networks (VANETs) for Ubiquitous Communication for DSRC radios in Vehicular Communications.